Ant life cycles are complicated and varied, but in almost all species the queens have wings and fly through the atmosphere to mate and find new places to live. Drawing by Brittany Benson. Text by Jackson Helms. Go the publications page to download Helms, JA, M Kaspari. (2015) Reproduction-dispersal tradeoffs in ant queens. Insectes Sociaux. When most people think of ants they probably picture a colony of wingless workers. Seen this way, it is easy to forget that ants are really just an odd family of wasps. 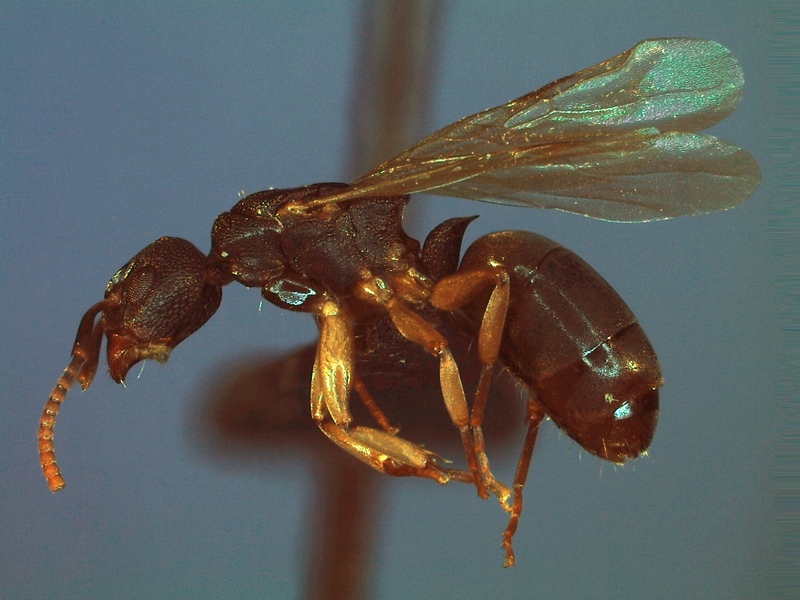 Most ant queens, on the other hand, are indeed wasp-like and have wings and fly. After developing from an egg virgin queens leave their birth nests and fly out into the world to mate, find a place to live, and start their own colonies. These aerial explorers—the mothers of the ant world—fascinate me. While most ant enthusiasts spend their time looking down at what worker ants do on the Earth’s surface, I spend my time looking up at what their elusive queens do in the atmosphere. In my most recent paper, out this week in Insectes Sociaux [http://link.springer.com/article/10.1007/s00040-015-0391-9], I take a comprehensive look at queens from across the ant family. By comparing the wings and bodies of over twenty species from Panama—ranging from the tiny Pheidole christopherseni, weighing in at less than a third of a milligram, to the grape-sized leafcutter ant, Atta colombica, with a two inch wingspan—I begin to answer some questions about ant flight. How well do different species fly? 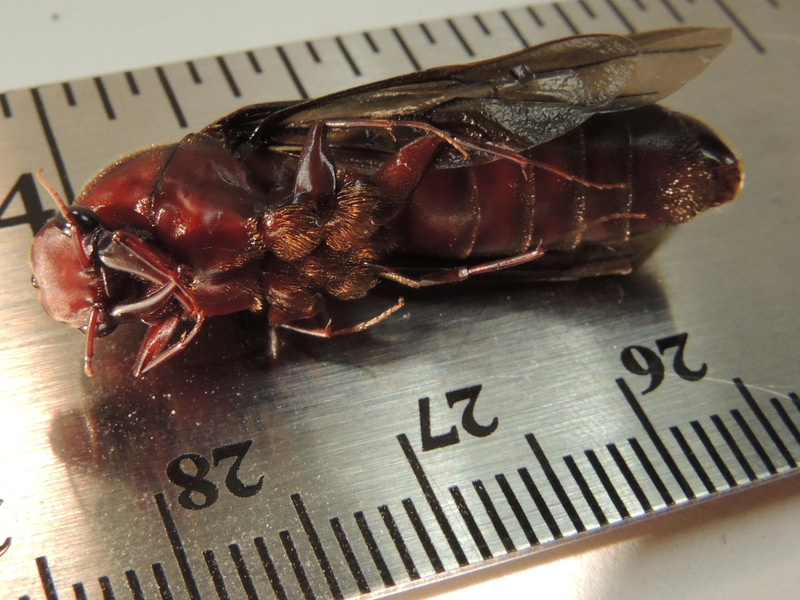 Does flight vary depending on whether a queen is a huntress, a farmer, or a social parasite? How and why do some species lose the ability to fly at all? I find that just as there are a ton of ways to be an ant (over 12,000 known species and counting), each species likewise varies in how it flies. Tiny species are nimble flyers, able to stay aloft for a long time, but large species fly faster and can cover longer distances. Huntress queens (from the subfamily Ponerinae), with their agile athletic bodies and large flight muscles, are decent all-around flyers. Soft-bodied tree-dwelling ants (subfamily Dolichoderinae) appear to have short, fast flights—probably just long enough to find a suitable hollow branch or snag to settle in. Social parasites—queens who take over or make their homes inside other ant or termite nests—can probably fly longer and farther than queens who go through the trouble of starting a colony from scratch. Likewise with the leafcutters, who plant and tend fungus gardens in their new homes. Dolichoderus laminatus queens fly through rainforest canopies and found new colonies inside the nests of tree-dwelling termites. On the other hand, those hardworking queens who grow their own colonies through sheer individual effort, without the help of crops or a manipulated host species, have evolved the ability to carry extreme loads of fat and protein to fuel them as they start popping out eggs. In fact, we believe they can fly with more weight than any other known insect. The flight muscles of some species can carry nearly nine times their own mass! Not only do ants fly, but, by this measure at least, some of them are actually really good at it. As for those species that have lost the ability to fly, permanently abandoning the skies of their ancestors and cousins, they may have done so in exchange for the ability to become extra fat and nutritious, thus ensuring they are productive mothers for the next generation. Tradeoffs like these are a pervasive theme in evolutionary biology (and pretty much everywhere else too). As exciting as these insights are, they are based on only a tiny fraction of the world’s ant diversity. And I’ve conspicuously ignored male ants, who are also winged and wasp-like. What about them? How do they fly? We have no idea. Ants are one of the Earth’s great animal groups. But we know next to nothing about how they move through the atmosphere to cross landscapes or colonize new areas. We have, after all, only just begun to explore the hidden ant world above our heads.